The problem with Dungeons & Dragons is that it takes too long to play. S1 Tomb of Horrors? Too long to play. I6 Ravenloft? Too long to play. Rappan Athuk? Too long to play. Dark Tower? Too long to play. All of them, all of those dungeons… Just too long to play. Plus, not everyone does roleplaying, so the dungeons, let alone the dragons, are right out. So what if you had a dungeon bash card game which could be played in real time, against the clock, in five minutes? Would that be short enough a playing experience? What if it threw in silly voices as a countdown? And had you beat a Baby Barbarian. Well, now you are talking. All this is possible with 5-Minute Dungeon. Published by Wiggles 3D, following a successful Kickstarter campaign, 5-Minute Dungeon is a real time co-operative dungeon bash played against the clock in which the players defeat monsters, overcome obstacles, get past people, and finally stick it to the end of dungeon boss—or fail and die in the process. All in five minutes. Designed for two to five players, aged eight and up, 5-Minute Dungeon is both quick and easy to teach, fast to play—because otherwise you will lose, and can played as a five minute or so filler, or as a longer thirty-minute filler for the full game. Inside 5-Minute Dungeon’s box can be found five Hero cards each colour-paired to an associated fifty-card deck; five Boss cards; and forty Door cards and ten Challenge cards. Each Hero card represents an adventurer—Barbarian, Paladin, Ranger, Thief, and Wizard—and a good cartoonish illustration, has space for a Draw Pile and a Discard Pile. Each also has a special ability. For example, the Barbarian has Slay, which allows him to discard three cards to Defeat a Monster, whilst a Wizard can Stop Time to Pause time until someone plays a card. What is great about these Hero cards is they can be turned over to show their female equivalents—Gladiator, Valkyrie, Huntress, Ninja, and Sorceress—and they each have different abilities. Whichever side of a Hero card a player decides to play, he gets the same deck of cards. The decks mostly show symbols—Arrow, Run, Scroll, Shield, and Sword—but each also contains a mix of special cards. The Paladin-Valkyrie includes Smite (Defeat a Monster), Heal (Choose a player to put their discard back on top of their draw pile), and Holy Hand Grenade (Defeat any card). Whilst each deck contains all five symbols, each deck has more symbols of one type. So the Wizard-Sorceress has more Scroll symbols and the Ranger-Huntress has more Arrow symbols. Each Boss card depicts the Boss and the number of Symbols needed to defeat it. It also gives the number of Door cards which will form the basis of the dungeon which the Heroes will play through before facing the Boss. The Door cards can be Monsters, Obstacles, and Persons, and each indicates what Symbol cards need to be played to defeat or overcome it. So the Monster card ‘Shark with Legs’ requires a Sword and two Arrow symbols to defeat; a Scroll and a Run symbol is needed to overcome the ‘Just a Bunch of Stairs’ Obstacle; and the ‘Barber-Arian’, a Person, needs two Swords and a Shield to defeat. The ten Challenge cards represent greater dangers that the Heroes must overcome and can include Events as well as monsters. So ‘Confusion’ causes all players to pass their hands to another player and with Ambush!, two more Dungeon cards are drawn and have to be defeated before Heroes can move on. Lastly, there is the Timer. Although you can set the stopwatch on your mobile or tablet to run for five minutes, a Timer is available to download as an app. It handles the five minutes for you perfectly in one of several voices. It really does add quite a bit to the game. PLAY A CARD TO MATCH THE SYMBOLS! Why haven’t you refreshed your hand? Why haven’t you refreshed your hand? Why? Get rid of the cards you played. They are done. Quick-quick-quick. No time. Draw the next Dungeon deck card. …and so on. The point is, 5-Minute Dungeon has a five-minute time limit and must be played as quickly as possible—with lots of shouting and throwing down of cards—with the Heroes still having enough cards to defeat the Boss once the Dungeon deck has been worked through. If the Heroes can do this, they win. If the Timer runs out before the Boss can be defeated, all of the Heroes run out of cards, or no-one can play cards to defeat a card, then they have lost! What is important here is that once cards have been played, they are swept out of the way and are not used again. Each Hero only has a limited supply of cards, so has to be careful in their use. Some cards, if they have gone into a player’s discard pile due to their Hero’s special ability or because of a card played, can come back into play if a Hero is healed for example. All of which takes place in five minutes. But then, once one Boss has been defeated, there is another Boss to defeat after that, and then again—and then again. In fact, the game comes with a total of five Bosses to defeat, each one having to be defeated in the five-minute time limit. At the end of which you are exhausted because 5-Minute Dungeon has become five×5-Minute Dungeon plus set-up and clean-up time. Set-up is faster than clean-up because you have to sort the big pile of discarded cards. You are also hoarse from all of the shouting required to tell everyone what everyone needs to do. Physically, 5-Minute Dungeon looks great. Both the Hero and Boss cards are done on thick cardboard and everything is done in full colour with very cartoony artwork. All of the game’s text is also really easy to understand. The Hero, Dungeon, and Challenge cards probably need to be put in sleeves as they do get handled and shuffled quite roughly quite often. The rulebook is also easy to read. 5-Minute Dungeon is a fun game. In fact, it is a blast to play. Yet it really is a filler, whether for just five minutes or the whole thirty or so minutes. It is does not offer a lot of depth in its game play and it is all reaction rather than action, so it is not a game requiring a lot of thought or indeed any strategy. So the replay value is not all that great even with some variety in the Dungeon cards. Plus it is a pain to have sort through the cards and put them back into their respective decks before playing again. One other actual playing issue is the Paladin-Valkyrie’s Holy Hand Grenade card, which is the only card that can defeat Bosses, whatever their size. This gives the players a very big advantage if the Paladin-Valkyrie’s player can keep hold of it until the Boss is faced. In fact, it is a bit of a game breaker because it negates the difficulty of defeating a Boss. That said, other cards do let the players stop the clock, consider their actions, and then start play, so there are powerful cards in each Hero deck—just not as powerful as the Holy Hand Grenade. Nevertheless, 5-Minute Dungeon scales well. With more players, the game adds more Challenge cards to the play and decreases the size of each player’s hand, but it also means that the players have access to the widest variety of cards. So the more the merrier and the more the chaos—and more importantly, the more the fun. Fun which is only exacerbated by the use of the Timer app. 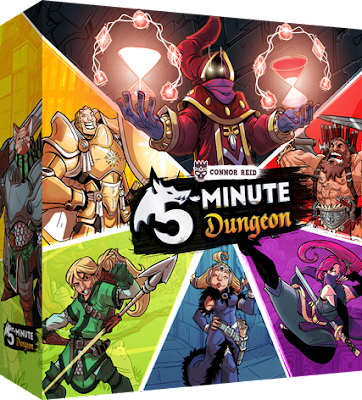 5-Minute Dungeon is a blast to play, really easy to teach, and really forces you to work together. You may not want to play too often, but when you, get a damned move on!